Below is the chart I promised yesterday. 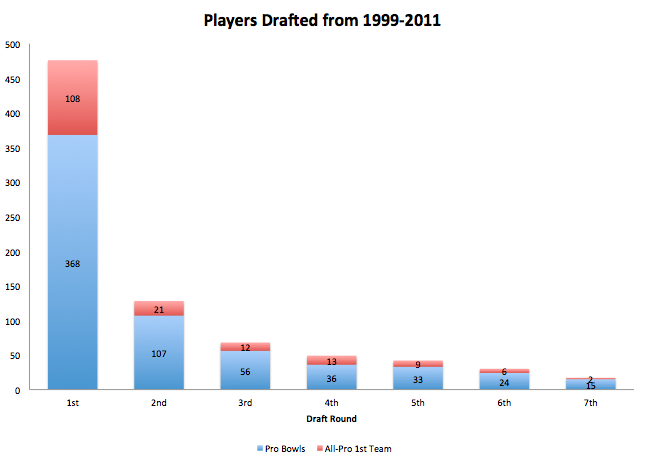 The data is from Pro-football-reference.com and it does not include the supplemental draft. The data is total occurrences, not individual players. So 108 All-Pro mentions includes multiples from players who made it more than once; it does NOT mean 108 different players made the All-Pro 1st team. I doubt anyone is overly surprised, but it certainly illustrates the importance of 1st round picks. Also keep in mind that there were less 1st round picks made overall than any other round other than the 2nd. So on a percentage basis, the data would be even more skewed towards the first round. Obviously there is some skew to consider, since a players get longer/more opportunities if they are drafted early. However, given how many variables go into talent evaluation and performance projection, it’s pretty clear to see that NFL scouts do a very good job of identifying the most talented players. It is extremely rare for an elite player to drop beyond the second round. We do not yet know if there is persistent “market-beating” talent among GMs or whether an “index-tracking” approach would be better off. I use those terms because I believe the stock market provides a good model of how to view drafting in professional sports. Just as it’s extremely difficult to consistently beat the market trading individual stocks, I expect it is also very difficult to draft consistently better than the “consensus” best available. Unfortunately, without seeing every team’s draft board, we don’t know the true “consensus” rankings. Therefore, we’ll try a few different ways of measuring draft skill, starting tomorrow. Tennessee (122), Green Bay (119), New England (118), Philadelphia (116), San Fran (114).